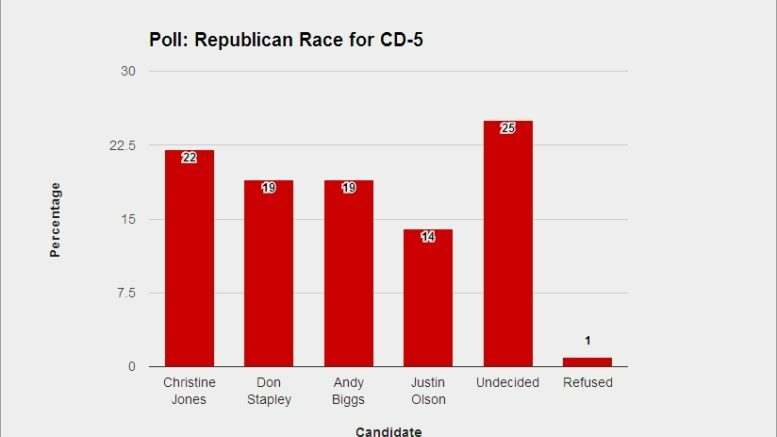 (Phoenix, AZ) – The most recent poll done by Data Orbital and commissioned by the Stapley for Congress campaign shows Don Stapley, Christine Jones, and Andy Biggs all within the margin of error in the Arizona CD05 race. The republican dominated congressional district encompasses Mesa, Gilbert, Chandler and Queen Creek. Data Orbital, a Phoenix based consulting firm, announced today the results of a recent survey conducted on likely primary election voters. After hard-hitting mailers and a barrage of negative messaging, both Biggs and Jones saw their unfavorable ratings shoot up 13% since the last poll at the end of July. The head to head showed Jones leading by 3% over Biggs and Stapley who are tied at 19%. This poll of 550 likely primary election voters in Congressional District 5 has a margin of error at plus or minus 4.2 percent, with a 95 percent confidence interval. Respondents were weighted on a number of different demographic figures based off previous voter turnout. Demographic data from the poll can be found here. Be the first to comment on "Data Orbital Poll: Conservatives Neck and Neck in CD-5"